Steve Kolowich wrote an article yesterday in the Chronicle that described the use of LectureTools, a student engagement and assessment application created by faculty member Perry Sampson at the University Michigan. These two paragraphs jumped out at me. The professor has had some success getting his colleagues to try using LectureTools in large introductory courses. In the spring, the software was being used in about 40 classrooms at Michigan, he says. Adoption elsewhere has been scattered. In 2012, Mr. Samson sold LectureTools to Echo3601, an education-technology company, which has started marketing it to professors at other universities. The program is being used in at least one classroom at 1,100 institutions, according to Mr. Samson, who has kept his title of chief executive of LectureTools. But only 80 are using the software in 10 or more courses. 93% of LectureTools clients use the tool for less than 10 courses total, meaning that the vast majority of customers are running pilot projects almost two years after the company was acquired by a larger ed tech vendor. Despite the billions of dollars invested over the past several years, the vast majority of ed tech is used in only a small percentage of courses at most campuses.3 Most ed tech applications or devices have failed to cross the barriers into mainstream adoption within an institution. This could be due to the technology not really addressing problems that faculty or students face, a lack of awareness and support for the technology, or even faculty or student resistance to the innovation. Whatever the barrier, the situation we see far too often is a breakdown in technology helping the majority of faculty or courses. 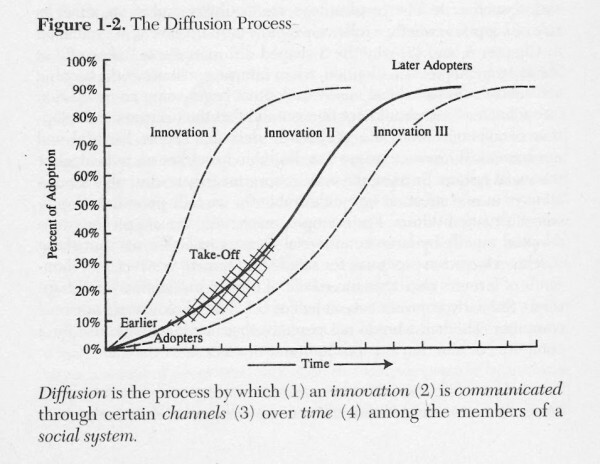 leading to the categorization of adopters (innovators, early adopters, early majority, late majority, laggards), and the combined technology adoption curve. Getting a new idea adopted, even when it has obvious advantages, is difficult. Many innovations require a lengthy period of many years from the time when they become available to the time when they are widely adopted. Therefore, a common problem for many individuals and organizations is how to speed up the rate of diffusion of an innovation. Ed tech vendors can be too susceptible to being persuaded by simple adoption numbers such as 1,100 institutions or total number of end users (millions served), but meaningful adoption within an institution - actually affecting the majority of faculty or courses - is necessary in most cases before there can be any meaningful results beyond anecdotes or marketing stories. The reason for the extended purgatory is most often related to people issues and communications, and the ed tech market (and here I'm including vendors as well as campus support staff and faculty) has been very ineffective in dealing with real people at real institutions beyond the initial pilot audience. Update: Add parenthetical in last sentence to clarify that I'm not just talking about vendors as key players in diffusion. This is what Geoffrey Moore called “Crossing the Chasm” – http://en.wikipedia.org/wiki/Crossing_the_Chasm – he doesn’t think his model applies to the consumer market but is more about institutions. Might it be that we’re confusing two separate issues here? The article started out discussing LectureTools, a specific application (i.e. product), and its low and stalling adoption rate (I hope that does not come off harsh to LectureTools, Echo360 or Mr. Sampson). I think the point Phil is trying to make though, is that we have all these great applications (again, products) that are not reaching a tipping point, critical mass, enterprise adoption… whatever, to help teaching and learning. I think this, in and of itself, is an interesting point: why are there so many individual efforts, many of which are apparently not garnering the level of recognition they deserve? However then the article switches to a discussion of “technologies” (i.e. product categories, not products), pointing to several (AV, presentation software, LMS, digital content, file sharing applications) and tries to make the same point. 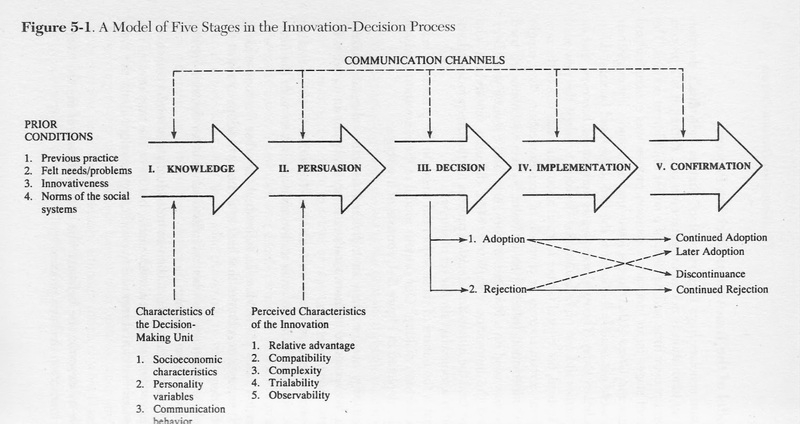 Indeed it might be that for institutions the new ideas–a specific product, like LectureTools–are indeed stuck at the Persuasion stage, but at least in this case the particular product category–Audience Response Systems–is not. Now after all that, I’m not arguing semantics–I’m arguing we have *too many starters and not enough joiners. * Or more generally, too many products in each product category. Why do we have innovative and creative faculty and campuses starting their own projects (products) like LectureTools in product categories (audience response systems) that are already crowded with viable options? Thanks as aways e-literate / MindWires for a great discussion starter! Patrick, you make some good points. My technique might have been sloppy, but the intent was to take the LectureTools example to talk about ed tech in general (mea culpa). Part of this interest of mine comes from recent conferences and seeing tons of examples of new companies and market hype (look what we could do) and almost no examples of results (look what we have done outside of anecdotes). Where I disagree with your characterization is that I’m not implying that many deserve more recognition or success. More important to me is the notion that ‘something’s broken to have this many companies and this much investment without many cases of deep adoption’. As for your suggestion of one big reason being too many products in each category – that makes sense in the LMS space or even audience response systems. But there are also cases of whole categories that seem stuck. Early alert systems, e-Portfolios, or adaptive learning systems, for example. So there are at least two cases embedded here. Any thoughts on the categories that never get past pilots (for the most part)? 1) how am I going to make the decision makers and users of the pilot outrageously happy? 2) how are we going to spread the pilot within the institution? 3) how are we going to utilize our happy customers to spread the word? Of course, we at Academic Business Advisors would love to work with any organizations who want to do this better than they are currently doing.